ASÍ is just around the corner from Hallgrímskirkja church - perfect to combine with a stroll around the historic Skólavörðuholt area and down to the pond! ASÍ, 'Alþýðusamband Íslands,' is the Icelandic Confederation of Labour. 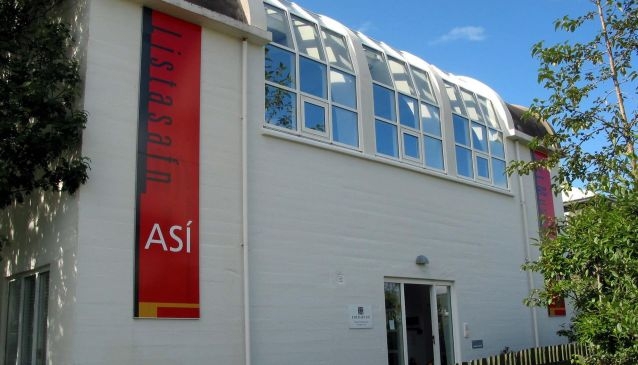 The ASÍ art gallery originally came about by one man's vision to bring art to the working classes, and has strived toward this goal ever since. The collection numbers pieces by some of the greatest 20th century Icelandic artists, including Kjarval, Gunnlaugur Scheving, Ásgrímur Jónsson, Júlíana Sveinsdóttir, Nína Tryggvadóttir, Jón Stefánsson, Þorvaldur Skúlason and Svavar Guðnason. The styles are varied but modernism is prominent, and nationalistic and social themes abound, as was the spirit of the time during the battle for independence and worker's rights. In addition to this, the gallery is a launch pad for contemporary artists. There are 10-15 exhibitions held in the gallery every year. The origin of the collection is that in 1961, publisher and industrial magnate Ragnar Jónsson donated his considerable art collection, numbering about 120 highly valuable pieces, to ASÍ. His dream was to bring art to the common people, and as a result ASÍ has specialised in installations in workplaces and institutions around the country. Over the years the collection has grown, many artists and private collectors have donated works, in addition to making its own acquisitions.